A print is a work of graphic art which has been conceived by the artist to be realised as an original work of art, rather than a copy of a work in another medium. A print is a work of graphic art which has been conceived by the artist to be realised as an original work of art, rather than a copy of a work in another medium. Prints are produced by drawing or carving an image onto a hard surface (known as a matrix) such as a wood block, metal plate, or stone. This surface is then inked and the image is transferred to paper or another material by the application of pressure, thus creating an impression, or print. The printed image that results is the exact reverse of the image on the plate. Unlike paintings or drawings, prints usually exist in multiple impressions, each of which has been created from the same inked plate. Artists began to sign and number each impression around the turn of the 20th century to ensure that only the impressions they intended to make would be in circulation. 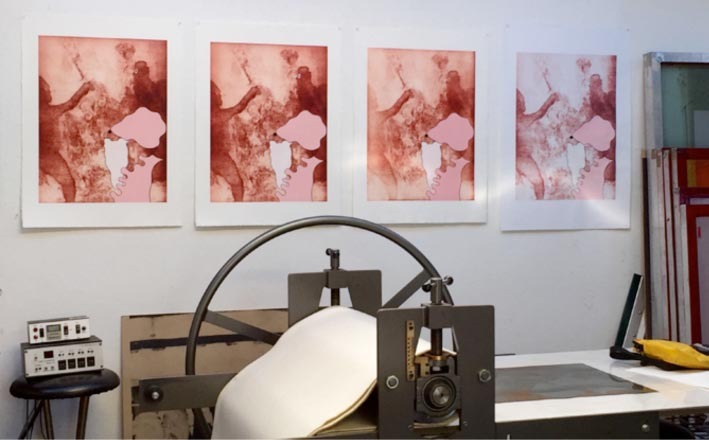 The set of identical impressions (prints) made from an individual matrix created by the artist, either working alone or in conjunction with a master printer are called an edition. Plates are not to be used in subsequent printmaking runs without the artist’s explicit authorisation. The process of printing the edition is therefore just as important to the authenticity of a print as the act of inscribing the image onto the plate. When artists use computers to create and manipulate their works, a large-scale ink jet printer can be used to print the works. These complex printers use a sophisticated print head to disperse the ink on the paper in a fine mist in order to deliver a consistently toned image. A digital print is only considered an “original print” if it was created by the artist to be realised specifically as a print. A digital print which is a copy of a work that originated in another medium, such as painting or drawing, is a reproduction and therefore is not an original print. IMAGE: Proofs of the Brent Harris print The Problem, created in 2015 printed by Trent Walter of Negative Press.